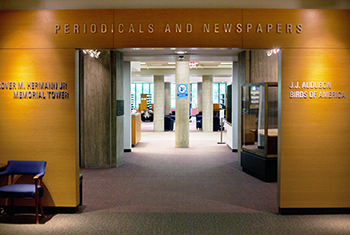 Located at the entrance to the Library, it is a "first stop" for many students, one where they can engage in independent inquiry or small group study. The comfortable and modular arrangement provides a welcoming social environment. 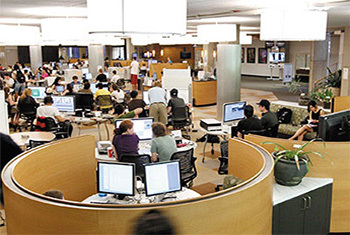 In addition to PCs, Macs and standard printers, this space includes media editing software, vocal recording booth, a large format poster printer, scanners and plasma screens to connect your laptops. Reserve the vocal booth to create a recording or the IC Project Room for group work! 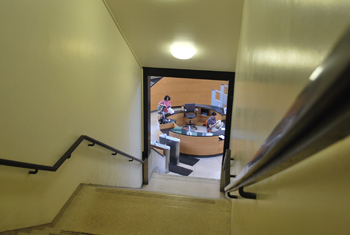 The Main Entrance is the only entrance/exit available to the public in University Library, except in the unlikely event of an emergency. Provides quick access to the second floor student lounge, vending machines, and the Forum Room. 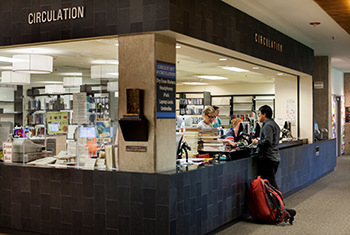 Circulation staff are available to help users with all procedures related to checking out and returning books. We provide a variety of services to assist you in your research, such as tips on how to find your materials. Circulation staff is available to help you if you still can't find them. Course Reserve and Interlibrary Loan material are available for pick up here. Flexible study space with a wide variety of seating options for studying alone or collaborating with others. This space provides access to reservable study rooms and media:scapes for group screen sharing. One Button Studio for presentation practice and recording, and plenty of access to power. Reserve the 1South Project Room. Quiet study zone with plenty of powered tables and open study carrels. Current issues of more than 2,800 periodical titles. More than 200 daily domestic, and international newspapers, such as The Chicago Tribune and a special emphasis on African newspapers. Current general interest magazines and periodicals such as The New Yorker and Rolling Stone." If you are experiencing an issue with your laptop computer or mobile device, stop by the Technology Support Center on the first floor of University Library for Northwestern IT to troubleshoot your issue. For more information on the services provided, or to contact the support center via email or phone, visit their website. The library offers a variety of media creation and editing software and hardware. The vocal booth is fully equipped with professional recording technology, including microphones, a mixing board, and a selection of recording software. It is perfect for recording your podcast, doing an interview, or a voice over for a video project.